On March 1, 2017, the Department of Physical Therapy presented the Sanderson Lecture at University of the Pacific featuring keynote speaker Bennet Omalu, MD, MBA, MPH, CPE, DABP-AP, CP, FP, NP. The event was sponsored by Dignity Health – St. Joseph’s Medical Center, Pacific Arts and Lectures, the School of International Studies, College of the Pacific, Pacific Athletics, the Thomas J. 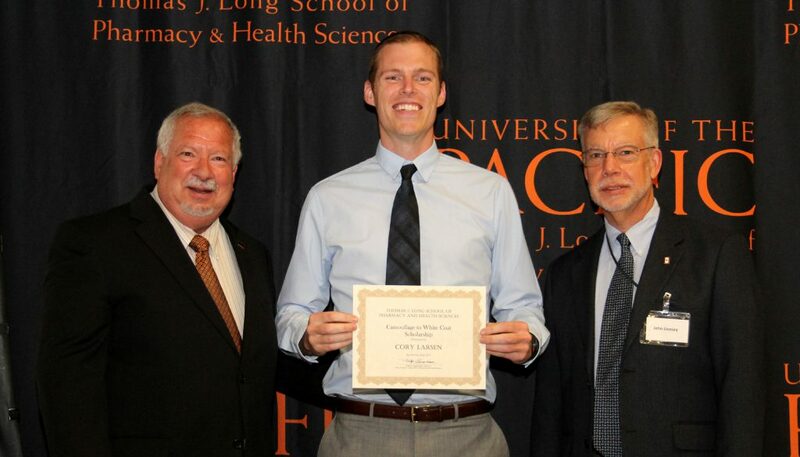 Long School of Pharmacy and Health Sciences and the Chan Family Endowment for Physical Therapy. Born in 1968 in war-torn Nigeria, Dr. Omalu’s family were refugees. Despite suffering from malnutrition in his childhood, he went on to attend medical school at the age of 15 and became a physician by age 21. He first came to the United States in 1994 to complete an epidemiology fellowship at University of Washington. American football would alter the course of his career and impact his life in dramatic ways. “I didn’t understand football,” said Dr. Omalu. “I did not know what a quarterback was.” He is credited as the first doctor to diagnose chronic brain damage in NFL athletes. In 2002, while working for the Allegheny County Coroner’s Office in Pittsburgh, Pennsylvania he discovered what would later become known as chronic traumatic encephalopathy (CTE) in the brain of former Pittsburgh Steelers offensive lineman Mike “Iron Mike” Webster. The former athlete died at age 50 after years of suffering from dementia, amnesia, depression and other ailments. According to Harvard Medical School, CTE is a neurodegenerative disease believed to result from repetitive brain trauma, including repetitive concussions or subconcussive blows to the head. At this time, a CTE diagnosis can only by confirmed by autopsy and all confirmed cases have had a history of repetitive brain trauma. While the total number of athletes affected by CTE is unknown, the Boston University CTE Center found evidence of CTE in the brain tissue 90 of 94 former NFL athletes. When Dr. Omalu’s findings first published, they were dismissed by many of his peers and met with fierce resistance from the NFL, who attempted to have his published papers retracted. “I was called a voodoo doctor,” Omalu said. Dr. Omalu’s story was chronicled in Concussion, by Jeanne Marie Laskas, and a film by the same name starring Will Smith. In his address at Pacific, Dr. Omalu stressed the dangers of children participating in contact sports, emphasizing that each head injury could cause irreversible brain damage. “In the past year, so many science papers have been published indicating that after one season of football, your child’s brain is permanently damaged — just after one season,” Omalu said. Dr. Omalu’s message resonated with doctor of physical therapy student (DPT) Amanda Whalen ’17. “We don’t let our children smoke or drink alcohol, but we encourage them to play a game that could cause brain damage,” Whalen said. The lecture was a testament to the legacy of another pioneering physician — George H. Sanderson, MD. Dr. Sanderson was the first orthopedic surgeon in Stockton and he also served as the university physician at Pacific’s Student Health Program from 1926 to 1969. He was regarded by his colleagues as an energetic and innovative participant in the growth of orthopedics. He practiced at San Joaquin General Hospital (SJGH) and St. Joseph’s Medical Center. In 1976, Dr. Sanderson’s colleagues at the Stockton Orthopedic Medical Group, Inc. established a fund for a lecture series to honor his 50 years of service to the community. In 2012, Dr. Sanderson’s daughter, Jean Sanderson; Joseph B. Serra, MD; Christine R. Wilson, PhD, PT; and Sister Abby Newton, vice president of the St. Joseph’s Foundation, were instrumental in bringing the Sanderson Lecture to University of the Pacific. Dr. Rahimian and Shaligram in the lab. “We should consider the type of sugar we are consuming, because different sugars behave differently in our body,” said Roshanak Rahimian, PharmD, MSc, PhD, professor of physiology and pharmacology. Dr. Rahimian, along with Sonali Shaligram ’17 and Farjana Akther ’19, collaborated on a study with researchers from University of Barcelona. “Our goal was to investigate the molecular mechanisms underlying the metabolic and vascular effects of these simple sugars and to determine whether these effects are exclusively related to increased calorie consumption or the type of sugar,” Dr. Rahimian explains. The results of the study were published in the prestigious American Journal of Physiology – Heart and Circulatory Physiology, in the February 2017 issue. The article entitled “Type of supplemented simple sugar, not merely calorie intake, determines adverse effects on metabolism and aortic function in female rats,” was co-authored by Gemma Sangüesa; Sonali Shaligram; Farjana Akther; Núria Roglans, PharmD; Juan C. Laguna, PhD; Roshanak Rahimian, PharmD, MSc, PhD; and Marta Alegret, PharmD. Their findings emphasize that the type of sugar consumed makes a difference. “Despite higher caloric intake in glucose-supplemented subjects, fructose caused worse metabolic and vascular responses,” Dr. Rahimian said. Although both sugar-fed groups consumed more calories than the control group, the total calorie intake of the glucose-fed subjects was higher than that of fructose. Also, despite this difference, only the fructose group exhibited a significant increase in final body weight. In addition, the fructose group showed more vascular and liver damages than those of glucose-fed group. To see cutting-edge technology, hear world-class speakers, meet alumni and connect with future colleagues, physical therapists should plan on attending the American Physical Therapy Association (APTA) Combined Sections Meeting (CSM). On February 15-18, 2017, over 14,000 health care professionals and students converged in San Antonio, Texas, for the 2017 meeting. This year’s conference hosted over 480 exhibitors and 300 sessions. Pacific physical therapy (PT) faculty, doctor of physical therapy (DPT) students and alumni were among the presenters. Todd Davenport, PT, DPT, MPH, OCS, associate professor of physical therapy, co-presented the session entitled “Evolution or Revolution? Physical Therapists in Prevention and Population Health.” Co-presented by Mike Eisenhart, PT and Christopher Hinze, PT, DPT the session proposed strategies for the role that physical therapists can play in implementing population health strategies. Rebecca Van Klaveren ’17 presented the podium talk entitled “Gender Distribution of Authors in the Journal of Orthopaedic and Sports Physical Therapy, 2010-2014,” co-authored by Dr. Fairburn and Dr. Davenport. What was something at the conference you were amazed or inspired by? Did you connect with any alumni or former faculty? The expanded partnership between the Department of Physical Therapy and SJCOE was based on their collaboration on another project, the Healthy Children program, which is sponsored by the Kaiser Permanente Northern California Community Benefit Fund. The program allows physical therapy students to participate in afterschool programs to teach local students about backpack safety and the importance of a healthy diet. The Pacific 5K Tiger Dash and Half Mile Cub Run serves as a fundraiser for the DPT Class of 2017. 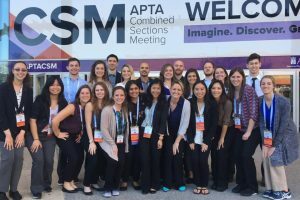 The majority of the funds raised will be used to help students with travel expenses and conference fees associated with attending the national physical therapy conference, American Physical Therapy Association’s annual Combined Sections Meeting (CSM). In addition to networking opportunities, CSM offers physical therapy students and practicing physical therapists access to the latest developments in their dynamic profession. Stiller elaborates, “We can find out the most up-to-date information, learn about current products available, policy changes, new legislation and changes to billing.” Stiller explains that staying up-to-date with changes in the profession allows physical therapists to give their patients the best possible care. A portion of the funds raised will go toward the Physical Therapy Visionary Endowment, which also supports students traveling to CSM. 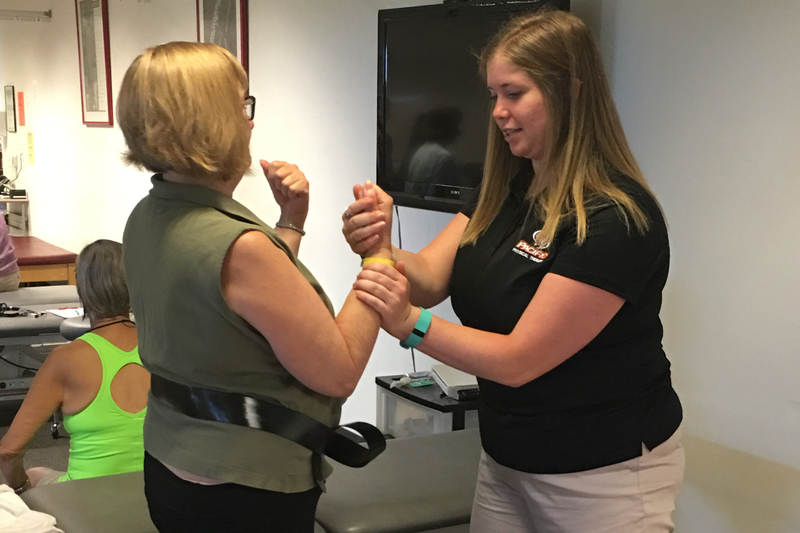 The purpose of the Physical Therapy Visionary Endowment is to help relieve the pressure of raising funds during the semester, thus allowing the DPT students to focus on their studies. Once the fund reaches $50,000 it will be matched by the Powell Match. Attending CSM is a key opportunity for professional growth and the process of organizing Tiger Dash is as well. Stiller elaborates, “You use the same skill set you would use in the clinic. Tiger Dash is heavily student initiated, that’s how it first began and it is definitely student run. The whole class gets involved.” The DPT students reached out to community partners to sponsor the event. Major sponsors for the 2016 event were Lodi Physical Therapy, Pine Street Physical Therapy, Golden Bear Physical and Occupational Therapy, Homer’s Barbershop, Team Movement for Life (Central Valley Physical Therapy and Delta Physical Therapy) and Fleet Feet. Do you ever feel overwhelmed by the amount of information you need to understand and remember for an upcoming exam? Having a good study strategy can help you tackle the mountain of information. We asked several student leaders to share with us how they study and what techniques they would recommend. What is your #1 study tip? 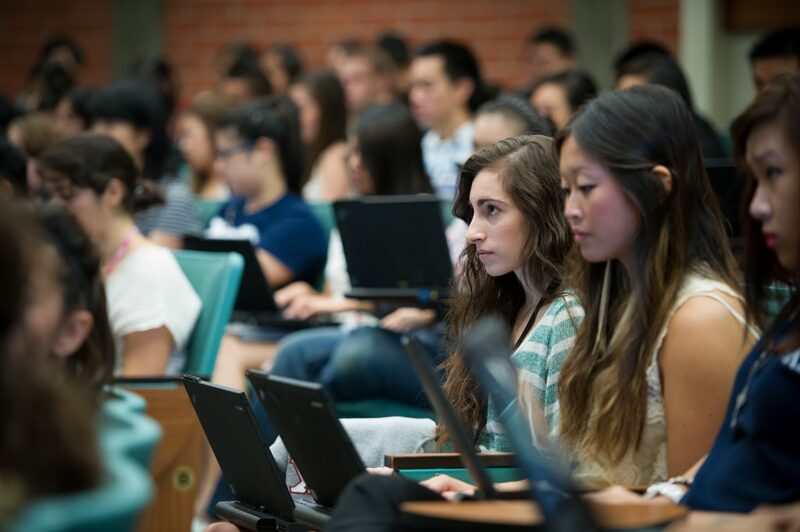 For more tips on how to make the most of your Pacific experience read 8 Things You Should Do During Your First Semester at Pacific. Jeannene M. Ward-Lonergan, PhD, professor of speech-language pathology and Jill K. Duthie, PhD, CCC-SLP, associate professor of speech-language pathology, identified a need for literacy services in the community surrounding Pacific. They also observed that the scope of practice for speech-language pathologists has expanded beyond speaking and listening to include reading and writing. In response they established the Language-Literacy Center (LLC), made possible through a Strategic Educational Excellence Development grant from the University’s Strategic Investment Fund. The LLC offers assessment and treatment sessions to students in grades 1-12, free of charge. “We really feel that there is a need to provide literacy services for students with language disorders in our area,” said Dr. Ward-Lonergan. 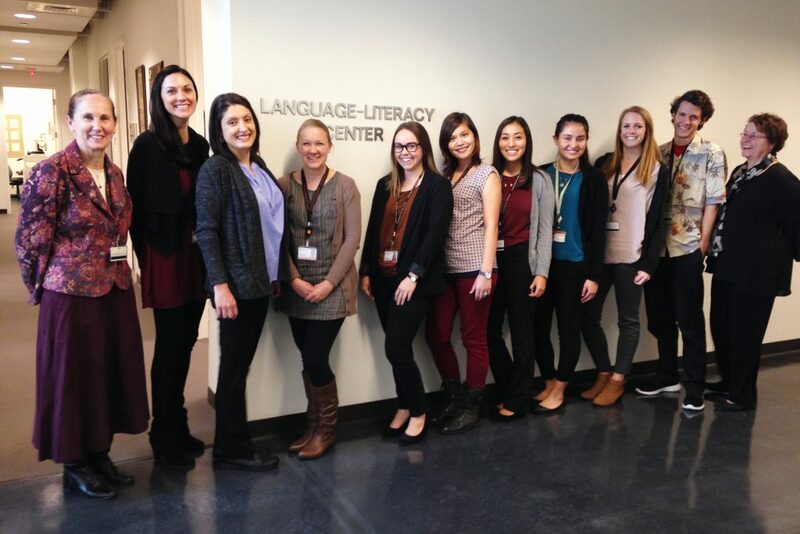 “We provide services free of charge to meet the needs in the community.” Speech-language pathology (SLP) graduate students met the LLC’s first group of clients in September 2015. The LLC gives SLP students the opportunity to apply, in a clinical setting, the concepts they are learning in their courses. Dr. Ward-Lonergan elaborates, “Students have an opportunity to engage in evidence-based practice with these clients.” She explains that the SLP profession has expanded to increasingly include written language. As the profession evolves, the ways in which graduate students are trained has been updated to reflect the changes, ensuring that graduates are prepared for the demands of the profession when they enter the field. Pacific’s SLP students gain clinical experience at the Scottish Rite Childhood Language Disorders Center, which focuses on speaking and listening. In contrast, the LLC focuses on “how to assess and treat written language disorders,” shares Dr. Ward-Lonergan. Through the LLC, students are given an immersive clinical experience. Christi Shaver ’17 explains that the students are responsible for planning their therapy sessions. Dr. Ward-Lonergan and Dr. Duthie are available to offer guidance, but the students are responsible for deciding how they are going to address the topic, how to tailor it to the client and how to make it engaging. One way the students make therapy fun for the client is to create themed lessons around their interests, such as bugs or superheroes. Do you know an individual in grades 1-12 who would benefit from these services? Learn more about the LLC and download a referral . How can students assess posture and balance if their patients are too young to follow directions? That was the challenge the doctor of physical therapy (DPT) students were faced with at the infant/toddler labs held earlier this spring. 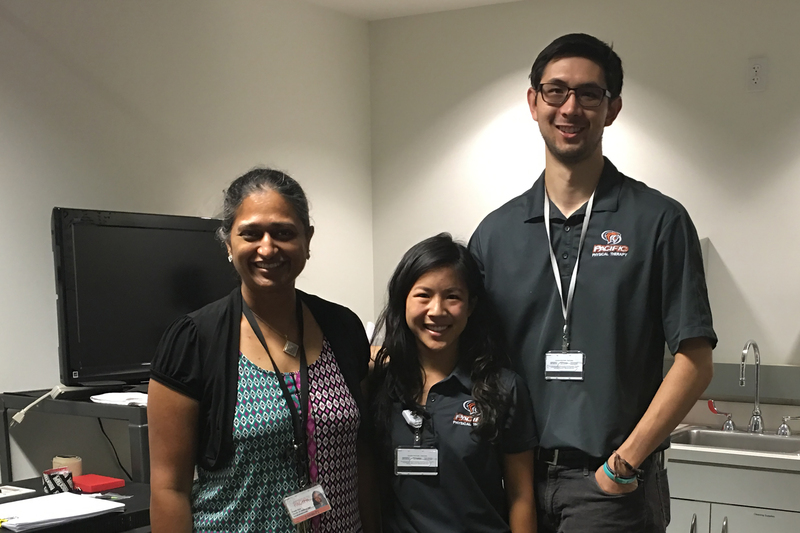 The lab was coordinated by Preeti D. Oza, PT, PhD, NCS, assistant professor of physical therapy. 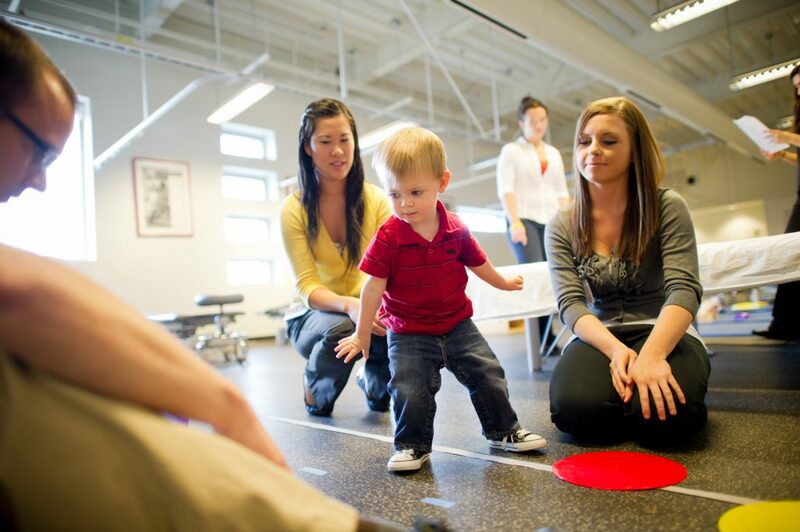 “Students do basic assessment of posture, mobility and balance demonstrated by the infant or toddler during play in sitting, standing and walking,” said Dr. Oza. Patel and Chang volunteered to be the clinic’s student leaders. As student leaders they were responsible for determining the best physical assessments for students to administer. They also created handouts which reviewed the recommended exercises and provided information on fitness programs available in the community, many of which are free. Both Chang and Patel discovered that the clinic challenged them to hone their communication skills. Chang explains that in an academic setting patient care is discussed using highly technical terms. One of the benefits of getting out of the classroom is to encourage students to practice communicating with their patients in a way that it is easy for the patients to understand. Learn more about OLLI@Pacific or Pacific’s DPT program. Agbongpolo with Dean Phillip Oppenheimer and Kourtney Sherman ’12, PharmD. Each year the School’s Scholarship Ceremony brings into focus the generosity of the donors who support our pharmacy students. 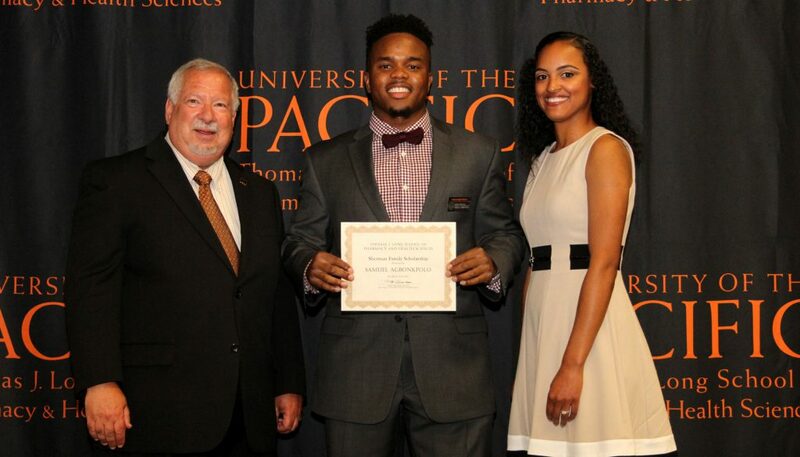 The history of how each scholarship was established is as diverse as the abilities and aspirations of the recipients. What all the recipients have in common is the feeling of overwhelming gratitude that comes with knowing that there are individuals and organizations who support them. Watch a video of students demonstrating the impact of their benefactor’s support here. Larsen with Dean Oppenheimer and John Livesey, PhD, professor of physiology and pharmacology and chair. From left to right: Dean Oppenheimer, Lucille Gould, Karen Gould, Milana Vachuska, Johnny Hsia and Michaela Vachuska at the Pharmacy Scholarship Ceremony. What aspects of this scholarship resonated with you personally? How would your professors and peers describe you? What are the characteristics of a successful pharmacist? There are many ways to make a transformative, tax-deductible gift to the School. You can make a gift online, by mail or over the phone by contacting Jen Flora at 209.946.2303. Imagine that you only have seconds to answer the following question: Which of the following medications used for rapid sequence intubation can inhibit cortisol synthesis? a) Etomidate b) Ketamine c) Propofol or d) Succinylcholine. 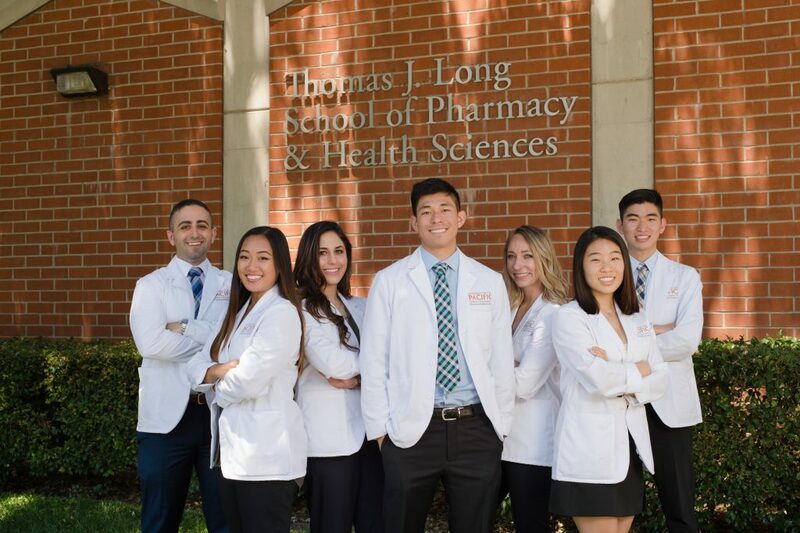 This is the type of question that is asked at the American College of Clinical Pharmacy (ACCP) Clinical Pharmacy Challenge, which is a national pharmacy student team competition. Across the country universities hold local competitions to identify their strongest competitors. 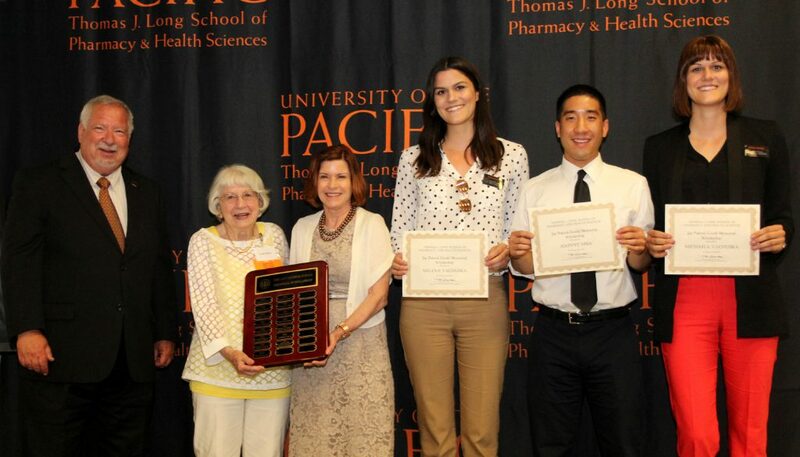 The Student College of Clinical Pharmacy hosted the competition at Pacific and 11 three-member teams competed. Pacific will be represented at the national level by Dilraj Sohal ’17, Claire Kim ’17 and Cindy Hsieh ’17. Eligible teams compete in up to four online rounds. The top eight teams advance to the live quarterfinal competitions, which will take place at the ACCP Annual Meeting in Hollywood, Florida, October 22-24, 2016. The competition has three sections. The trivia/lightning round consists of 15 true-false questions. The questions cover the subjects of pharmacology, pharmacokinetics, pharmacodynamics, pharmacogenomics, biostatistics and health outcomes. The second segment is a clinical case and participants answer five questions after reviewing the clinical case vignette. In the final portion of the competition, students answer questions covering a wide range of topics that relate to clinical pharmacy. The format of the final portion is similar to Jeopardy and teams are asked questions that belong to five specific categories. These five categories are selected from a larger group of topics ranging from endocrinology to vaccinations. Sohal explains that the fast paced environment forces you to rely on your instincts. She adds that the way that the competition is structured teaches you to trust your teammates as you work collaboratively. Hsieh adds, “I think that working in a team helps you realize your strengths and weaknesses. When you go into the clinical field you are in essence working as a team.” Dr. Kehoe agrees, “These kinds of opportunities give them a chance to solve problems by working together.” He explains that today’s health care professionals work in teams with each individual contributing their unique skill set.